The city of Baghdad was founded in the 8th century, after the Caliphate defeated the Umayyads. The caliph al-Mansur wanted his own capital to rule from. He chose a site about 30 km to the north of the Sassanid capital of Ctesiphon, along the banks of the Tigris, and began to draw up plans for its design and construction. He wanted Baghdad to be the perfect city, to be the capital of the Islamic empire under the Abbasids, so he brought in thousands of architects, engineers, surveyors, carpenters, blacksmiths and over a hundred thousand laborers from across the Abbasid empire. He consulted astrologers, and according to their advice, laid the first ceremonial brick on 30 July 762. 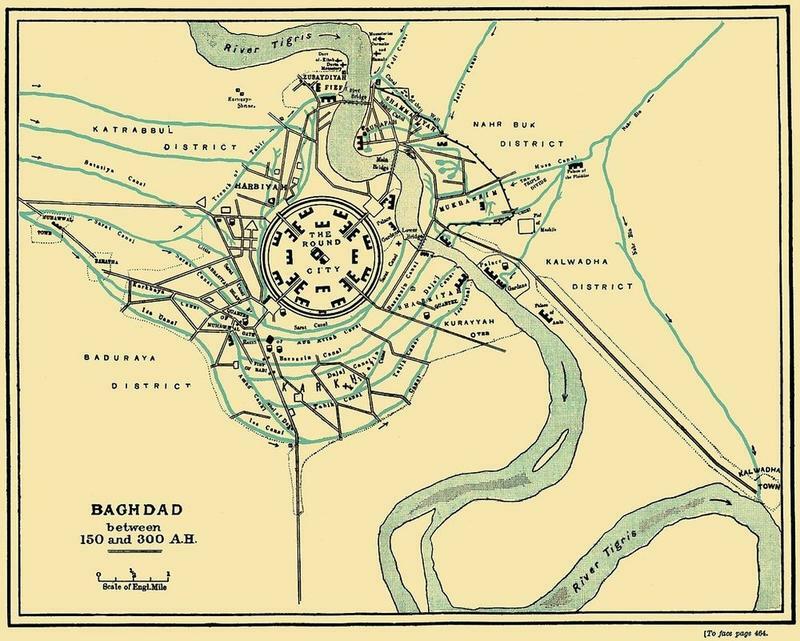 The round city of Baghdad in the 10th century, the peak of the Abbasid Caliphate. 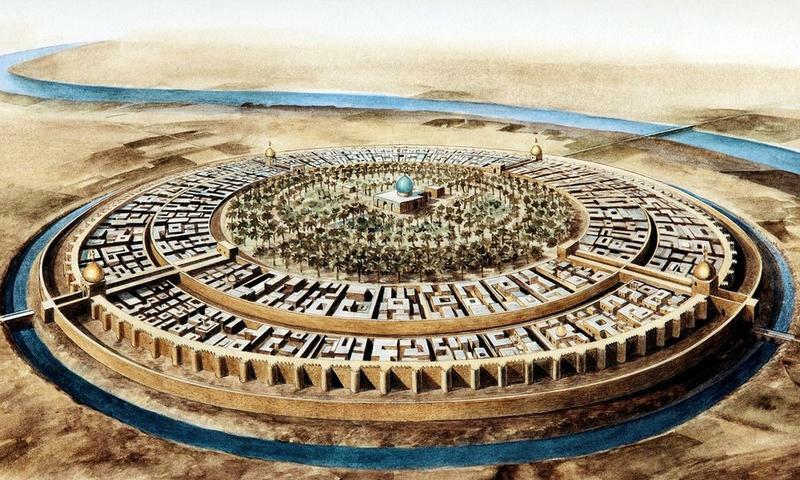 The original city was designed in the shape of a circle 2 km across. The circle was the Mansur’s tribute to the geometric teachings of Euclid, whom he had studied and admired. In the center of the circle stood the two finest buildings in the city: the Great Mosque and the Golden Gate Palace, the caliph’s residence. Surrounding the palace and the mosque was an esplanade and a waterside building, in which only the caliph was allowed to ride on horseback. At the edge of this enclosure were palaces of the caliph’s children, homes for the royal staff and servants, the caliph’s kitchens, barracks for the horse guard and other state offices. This central area was protected by an inner wall. The living quarters and commercial buildings were concentrated in a ring between the exterior wall of the city and the second fortified round wall. The exterior perimeter wall was 30 meters high and 44 meters thick at the base. It was crowned with battlements and flanked by bastions. It was surrounded by a deep moat. The city was divided into four quarters by two perpendicularly intersecting streets that ran from end to end of the outer perimeter wall and terminating at four gates. Each of the four gates pointed towards a different city — Basra, Kufa, Khurasan and Damascus — and named after that. The gates opened onto an arcaded street running all around the exterior inhabited ring. Unfortunately, nothing of this great city remain today. The last traces of al-Mansur’s Round City were demolished in the early 1870s when Midhat Pasha became the Ottoman governor of Baghdad. Midhat Pasha might have had little interest in preserving history, but the big reforms that he introduced for Baghdad and Iraq in general, transformed the face of the city. He built countless schools and educational institutes, of which there were none in Baghdad, as well as hospitals, granaries, public parks, a water supply system, roads and bridges. He introduced land reforms and tax laws and encouraged nomadic tribes to settle and cultivate. The three years that Midhat Pasha spent as governor were the most important years in Baghdad’s modern history.